Make sure that furniture is protected from damage and scratching. Old sheets or blankets are ideal for this. You should also make sure that your furniture won't be able to slide around or fall over. Ensure drawers can't slide out - because they will if they can especially on shape corners or roundabouts. Try tying string around the chest of drawers or stacking heavy boxes in front of them to prevent this. It generally makes sense to load any tall furniture such as wardrobes along the sides of the van - then either tie them to the side of the van, or pack around them so that they can't fall over. Pack the heaviest boxes at the bottom. Stacking boxes in the van is fine but to prevent damage and instability you need to ensure that the boxes at the bottom will stand the weight of those above them. Also, make sure the boxes at the top of the pile are tied or wedged into place so they won't go flying at the first corner or roundabout. Ensure all boxes are taped closed wherever possible to prevent 'speed hump ejections' from the box. Pack your hire van from the front backwards. This may sound obvious, but is often overlooked. You should pack your van from the front backwards. 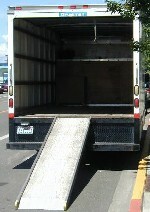 Start loading by putting your belongings right to the front of the van, against the bulkhead. This ensures that things can't slide forwards when you brake. Taking this approach should also help to maintain a balanced load with even weight distribution, making the van easier and safer to drive. Tie some rope or straps across the van to prevent the load from sliding backwards or toppling over as soon as you accelerate or go up a hill. Don't rely on wedging things in - it's surprising how easily they can come free once you're underway. Now you're loaded take a look at our Driving A Hire Van guide for tips on driving and parking a van. Disclaimer: We hope the information on this page will be useful. But vanrental.co.uk will not be held responsible for any damage to your possessions while they are in transit, nor for any damage or losses resulting from the use of a rented vehicle.